Martha Silva poses with her mother, Gabriela Martinez. Silva says that her mother's depression should have been caught 20 years earlier than it was. (Health.com) -- Gabriela Martinez always spent a lot of time in bed, and she rarely laughed, or even spoke. For decades, her family shrugged off this unusual behavior as nervios, or "nerve problems." "We thought, 'That's how she is,'" her daughter, Martha Silva, recalls. 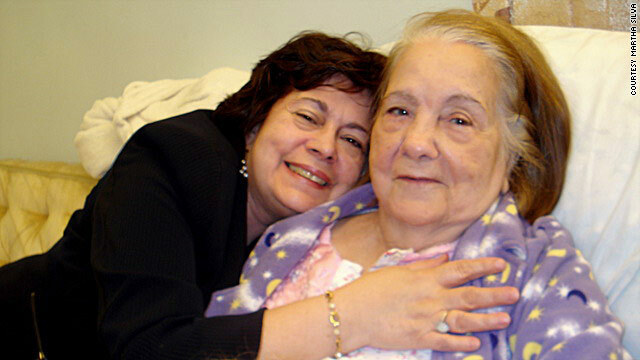 Finally, five years after moving to the United States from Cuba with her family in 1965, Martinez visited a psychiatrist at her daughter's urging and was diagnosed with depression. "My family never knew she had depression," Silva says. "She should've been diagnosed in her 20s and not her 40s." The Silva family's story is all too common in the Latino community, where a deeply rooted mix of cultural and socioeconomic factors have conspired to stigmatize people with mental illness, in many cases causing them -- and their families -- to delay or avoid seeking professional help. Although the rates of mental illness among Latinos and whites in the U.S. are roughly equivalent, whites are far more likely to receive mental-health treatment (about 60 percent more likely, a 2008 study found). According to a 2001 Surgeon General's report, only about 20 percent of Latinos with a psychological disorder consult a general health-care provider about their symptoms, and just 10 percent contact a mental-health specialist. "When Latinos think of mental illness, they just think one thing: loco," says Clara Morato, whose son, Rafaello, was diagnosed with bipolar disorder at age 18. "[Latinos] don't want to be labeled, and they don't want to be labeled as the family with a relative who's crazy." These beliefs represent a serious public-health concern, considering that the 49 million Latinos in the U.S. constitute the country's largest and fastest-growing minority group. The Latino population has risen by nearly 40 percent in the last decade and is expected to make up close to one-third of the nation's inhabitants by the year 2050. And, thanks to recent health-insurance reforms, more Latinos than ever before may be seeking treatment for the first time in the coming years. Delivering appropriate mental-health care to the tens of thousands of Latinos who need it but are hesitant to accept it may not be easy. "The stigma is a phenomenon that's fairly complicated," says William Vega, Ph.D., a provost professor at the University of Southern California, in Los Angeles, and a leading expert on mental health among Latinos. "It's a major question in the field as to how to manage it, because there are so many cultural nuances." The stigma surrounding mental illness and the reluctance to get treatment aren't unique to Latinos, of course. Less than one-third of the estimated 18 million American adults who have a mental illness that affects their day-to-day functioning receive treatment, according to a 2008 government survey. Research and anecdotal evidence suggest that stigma -- and what's known as self-stigma -- is a major factor standing in the way of mental-health care for Latinos. In a recent study, Vega surveyed 200 depressed and low-income Latinos in Los Angeles; more than half said that depressed people weren't trustworthy and that they'd be unwilling to socialize with someone who's depressed. Those self-stigmatizing respondents were less likely to take medication and keep scheduled appointments with primary-care physicians, the study found. Some of the reasons behind the reluctance to seek professional help are cultural. Religion is very important to the Latino community, and some Latinos turn first to their church -- or even to the folk healers known as espiritualistas -- for help with mental-health problems, some experts suggest. Even more so than American culture as a whole, Latino culture values self-reliance, which can discourage people from talking about their problems, says Jane Delgado, Ph.D., a clinical psychologist and the president of the National Alliance for Hispanic Health. "They feel they have to resolve issues themselves," she says. "They don't want to be a burden." This seems to be especially true of men, says Silva, who, spurred by her mother's experience, started leading Spanish-speaking outreach classes for the National Alliance on Mental Health (NAMI) chapter in Hudson, New Jersey. "Men usually don't get involved," she says. "They often get scared." If Latinos do seek care, more often than not it will be from a clinic or general practitioner rather than a specialist. "They won't say, 'I'm depressed,'" Vega says. "Many Hispanics will go to the primary health-care clinics and complain about physiological symptoms." Or, as Silva puts it, "They go to regular doctors so it won't make them 'crazy.'" Even for motivated people, significant barriers to mental-health care exist in the Latino community. Perhaps most important, Latinos have the highest uninsured rates of any ethnic group in the U.S. In 2007, nearly one-third of all Latinos had no health insurance, compared to 10 percent of whites. Moreover, a 2006 American Psychological Association survey found that only 41 percent of insured Latinos had mental-health benefits, compared to 65 percent of whites and 63 percent of African-Americans. Finding the time for care can also be a challenge. Latinos may have manual labor or service jobs -- nearly one-quarter work in the service industry -- that require them to work odd hours, long shifts, and overtime, Silva points out. And if a Latino with a mental-health problem does visit a health clinic or doctor's office, the language barrier might be insurmountable, as there is a shortage of Spanish-speaking health professionals, especially psychiatrists, psychologists, and therapists. There are only 29 Latino mental-health professionals for every 100,000 Latinos in the U.S., compared to 173 non-Hispanic white providers per 100,000 non-Hispanic whites. Recent studies have suggested that specialists need to comprehend different cultural views on mental illness in order to give their patients the best possible care. "Many physicians, psychiatrists, [and] therapists are well-trained," says Delgado, "but they aren't trained in understanding culture and how they're impacting someone's world." Bridging the gap between Latinos with mental illness and treatment providers is more pressing than ever, due to the changes under way in the American health-care system. The Affordable Care Act, which was passed by Congress in March and went into effect in September, could make health care more accessible and affordable to the nearly 16 million Latinos in the U.S. who are currently uninsured. By 2014, mental-health and substance-abuse services will be an essential component of Medicaid, as well as of the affordable health plans found in the new state-run insurance marketplaces. In the meantime, according to Vega, so-called safety-net clinics that treat people without health insurance have received additional funding, some of which could go toward expanding mental-health care. As a result of these changes, many Latinos could be seeking care for the first time. "We have a system that is unprepared," Vega says. "We need to prepare physicians and health-care providers of what's to come -- to not stereotype patients. They need to ask the right questions, ask them how they feel about medication, and advise them on it." To bridge the gap and to ultimately squash the stigma, mental-health professionals and advocates have to educate Latino families and health-care providers about mental illness, Vega says. Vega has seen some encouraging developments. There are more Spanish-speaking personnel in mental-health clinics now than at any time in the past 30 years, he says. But the quality of health-care services provided to Latinos still needs improvement: The wait to see a mental-health specialist in a public clinic can be up to two months. "It's a massive switch [from] what we're seeing right now, and the demand is going to be there," Vega says. "We're just at the first stage of transition." Rafaello Morato is an example of the progress that's been made -- and also the work that remains to be done. Rafaello, whose family is originally from Colombia, was diagnosed with autism at age 4 and began taking medication. His mother, Clara, was hopeful that his mood swings and violent outbursts would go away as the years went on, but as he got older, his condition only escalated. His troubles culminated during his senior year in high school, when he threatened his school principal with a sharp object during a dispute over a Halloween costume. After an order from the school to seek psychological evaluation, Rafaello was diagnosed with bipolar disorder. Now 22, Rafaello is taking medication and doing better. Though he still has violent outbursts on occasion, he has a job at a local movie theater and hopes to attend college in the near future. Rafaello got the treatment he needed and his condition is under control, but he still puts up with some prejudice from his own family. "They don't understand what he goes through every day to stay stable," Clara says. "I try to ignore some of the inappropriate remarks they make. But I've learned to fight back by reminding them how much progress we have made, and that always seems to disarm them." Clara has taken part in the Spanish-language classes that Silva leads at NAMI, which are designed to teach the families and caregivers of mentally ill people about medications, communication strategies, and other aspects of caring for their loved ones. Silva thinks the outreach is making a difference. In her community, she says, Latinas are "speaking up about mental health more," and "bipolar disorder is becoming more acceptable." The change can be seen in her own family. Silva's son, who is 40 years old, also suffers from mental illness. He has been diagnosed with bipolar disorder and substance-abuse problems but only recently started taking medication after years of being in denial.